This is kind of a late post but i figured since i was updating the site to still post about this – Just in case someone hasn’t watch it yet. A week ago Lily attended an Emmy Contenders chat with the Los Angeles Times, where she spoke about Les Miserables. You can watch the full chat below! For those of you who don’t know, today it was held a press conference for the upcoming Bond movie where a few details on said movie were revealed. It was during said press conference that it was revealed that Rami Malek would be playing the villain (or “baddie”, depending on how you’d rather call him)! Taking advantage of the fact Lily and her Extremely Wicked, Shockingly Evil and Vile co-star were doing press for their movie, they were confronted with the revelation and shared their thoughts on the news. You can watch the video below. Hello Lilyians! Another masterpost coming your way – This time on Extremely Wicked, Shockingly Evil and Vile Press Tour! 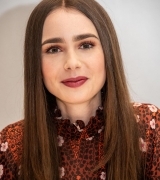 Just like on all our other masterposts, this one will be constantly updated as new interviews get released of Lily speaking about the movie. Make sure to follow on twitter @mscollinsnet, as i will be notifying you all there of post updates! Lily is currently in London, where she attended the premiere of Extremely Wicked, Shockingly Evil and Vile earlier tonight with her co-star Zac Efron and director Joe Berlinger. Photos of Lily leaving her hotel and at the premiere have been added to our gallery, and you can also watch two interviews below! FOX Searchlight has released a featurette on Tolkien‘s influence, featuring Lily and co-star Nicholas Hoult. Not only they speak about the influence, but we are also given a behind the scenes look. With Tolkien promotion happening right now, i have decided to create this post to place all interviews Lily and her co-star Nicholas Hoult give while promoting the movie. Any new update will be notified through our twitter @mscollinsnet! Lily has been quite busy this week with promoting Tolkien and Extremely Wicked, Shockingly Evil and Vile. Her first stop was to promote Tolkien, and she attended a press conference for the movie in Beverly Hills. Photos have been added to our gallery, as you can check out below! While promoting Les Misérables in New York this past week, Lily and her co-stars David Oyelowo and Dominic West sat down with AP News to talk about their new show. Along with the articlethat you can find below, portraits taken at the studio have been added to our gallery. NEW YORK (AP) — David Oyelowo kept his distance from the rest of the actors while filming the upcoming six-part retelling of ”Les Miserables .” It wasn’t personal. The reason was because Oyelowo was playing the morally rigid, obsessive Inspector Javert and felt he had stay an arm’s length away to remain in character. The added preparation can be seen on PBS’ “Masterpiece” beginning Sunday when Javert begins his hunt for the heroic fugitive Jean Valjean, played by West, in a powerful adaptation of Victor Hugo’s mammoth novel by screenwriter Andrew Davies.